The main idea is to compare the results provided by the newest versions of MPEG-4 codecs when they are used by an ordinary user for home video compression. As a rule, such users prefer simple and popular programs to play DVD movies or digitize signal from tuner. Also they rarely change codec's default settings. So used default codecs settings in our comparison varying only the bitrate value. Another goal of this testing was to trace the evolution of the DivX codec. Three versions of this codec took part in the testing: DivX 5.2.1, DivX 4.12, DivX 3.22. The testing also illustrates the usage of two additional options in DivX 5.2.1: GMC (Global Motion Compensation) and Quarter Pixel, that were announced to improve quality on some video sequences. Bitrate handling (does your movie fit on the CD?). PSNR - is a metric used to compare two pictures: the more per pixel difference between the pictures is the less is PSNR value. We use the logarithm of the average value of the per frame PSNR metric to compare two sequences. So the higher is the codec's line on the graph the better is the quality of compression performed by this codec. Y-PSNR is the difference in brightness component, U-PSNR and V-PSNR are the differences in hue components. The diagram below clearly demonstrates the advantage of DivX 5.2.1 over XviD 1.0.3. 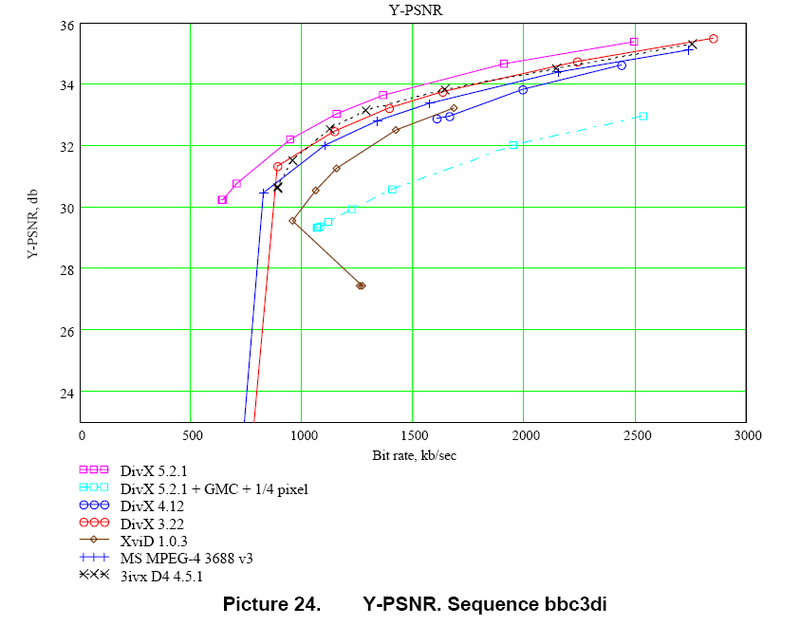 On this picture Y-PSNR values are shown. The higher is the line the better is the quality. In most cases the PSNR value is in accordance with the compression quality. But sometimes this metric does not reflect presence of some important visual artefacts. For example, we cannot estimate the quality of the blocking artefacts compensation performed by some codec or detect the presence of the "snow" artefacts (strong flicking of the stand-alone pixels) in the compressed video using only PSNR metric. Also in some cases it is difficult to say whether 2 dB difference is significant or not. That is why we use visual comparison of some frames in addition to the PSNR graphics. This will not help us to understand the whole situation, but will allow to demonstrate some interesting features of the codec (e.g. block artifacts compensation). These pictures present the same frame compressed by two different codecs with the same bitrate. One can see that the frame from the sequence compressed by XviD 1.0.3 has much better quality. Different codecs show significantly different results on different sequences. That happens because of all represented sequences have different character (motion, noise e.t.c.). This fact allows to define which codecs do well with any kind of video sequences and which provide good results only for some class of sequences. But all the diagrams do not answer the question whether there is a leader among these codecs which could be used for compression of most types of video. In order to find out general characteristics of each codec on the whole testing set we give different scores to the codecs according to some special rules and place the results in a table. The more scores some codec gets the better it is.